All posts tagged: "Halong Caves"
Home Posts Tagged "Halong Caves"
Cat Ba Island is one of the main destinations of the Halong region. 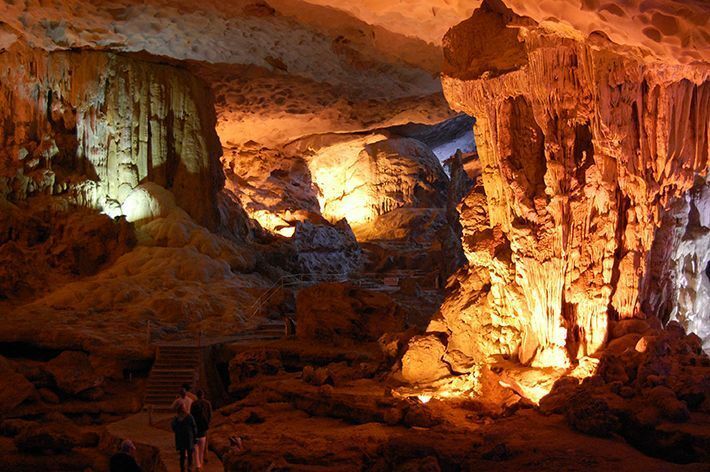 The island is famous for its many caves, both small and large, and prominent among them are Quan Y (historic Hospital Cave), Trung Trang, Dong Hoa Cuong and Thien Long caves, all with numerous impressive stalactites and stalagmites. Dong Hoa Cuong, or Diamond Cave, is one of the most amazing caves and you should make a point of seeing it if you join our Heritage Expedition four-day program. Close to the village of Gia Luan one of the most beautiful and famous caves of the Cat Ba Islands, Hoa Cuong cave or Da Hoa cave, can be found. 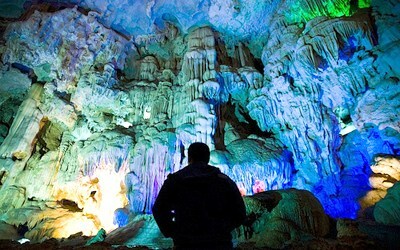 It has been named Hoa Cuong (Diamond) cave because of the interior’s iridescent sparkle, just like a diamond. The cave is located in a large mountain to the northeast of the village, at an altitude of 50 metres above sea level and 10 metres in height. Reached through a large arched entrance, hidden by trees and bushes, the cave is wide and quiet, 25 metres in width and 100 metres long, with a pleasant temperature, perfect for a visit. In the Diamond Cave, there are many stalactites created in a variety of shapes by Mother Nature, many taking on the appearance of humans and animals. On the right-hand side of the cave is a giant curtain of stalactites, which inspired a local legend. According to the legend, the King of Heaven found the climate here idyllic and the scenery charming, so he would take the princes and princesses to spend time together here in the cave. The stalactite curtain separated the boudoir of one of the princesses, guarded by two stone lions, where the princess rocked her baby to sleep on a magnificent bed, accompanied by a small fairy. As you explore further into the cave you come across a luminous cool lake, the water so clear that you can see the white pebbles at the bottom. The people of Gia Luan believe that the women in this region have white skin as a result of bathing in the lake. Close by is a rock that looks like a boat belonging to a prince, giving the lake a romantic feeling and perpetuating the legend of the cave. When light floods into the cave, the lake shimmers and the reflections on the stalactites and stalagmites appear to be like flowers blooming, creating a sense of magic. Archaeologists have excavated here and discovered the fossilized teeth of an ancient gibbon dating back tens of thousands of years, clearly demonstrating the existence of an ancient gibbon species living in Cat Ba Island. 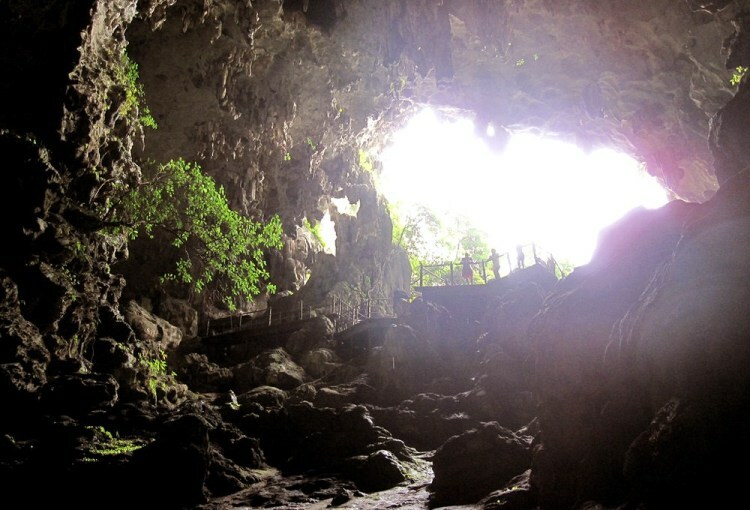 Hoa Cuong cave is a particular favorite of both domestic and foreign visitors because of the pristine beauty of the area, the legends surrounding it, and the fascinating history revealed by the archaeologists. One not to be missed!